Can you believe we’re almost in August already? Make the most of the late summer bank holiday with an open air concert in Kendal featuring iconic rock legends Status Quo led by Francis Rossi OBE! This concert is a rare opportunity to see Status Quo in action, a band who have had more chart hits in the UK than any other rock band! The band is currently made up of Francis Rossi, Andy Bown, John Edwards, Leon Cave and Richie Malone. Status Quo will be coming to Kendal, where they will form part of the fantastic line-up at Kendal’s latest festival event ‘Rock On Kendal’. 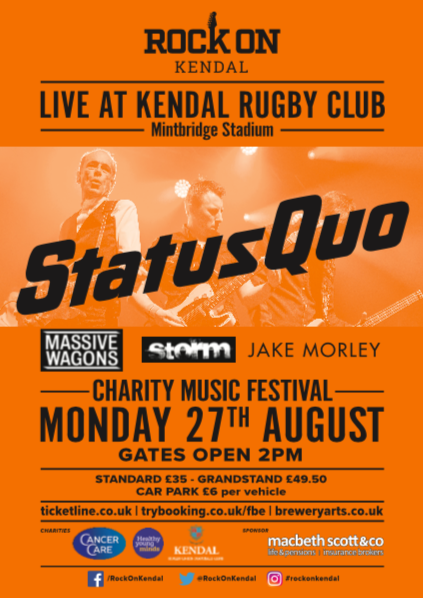 ‘Rock On Kendal’ is a charity music event taking place at the new Mintbridge stadium in Kendal on Monday 27th August 2018 and Status Quo will be supported by an impressive line-up including Massive Wagons, Storm and Jack Morley. The impressive Mintbridge stadium accommodates around 600 people and the atmosphere is set to be fantastic! Tickets are available from Mintbridge, Ticketline and The Brewery Arts Centre, Kendal.